- Client-side (java) scripting, no CGI/PHP required for the cart. - Multiple Additional information fields (ie. color, size, etc). 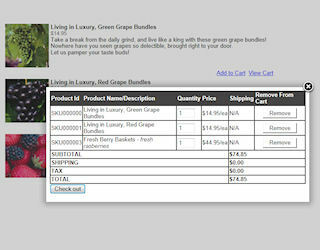 - Minimum order, configure a minimum purchase amount before users are allowed to checkout. - 3rd Party Payment Processor support: PayPal, Authorize.net, WorldPay, LinkPoint. - The extension makes adding/editing/removing products very easy. - Added lightbox to display a larger version of the product image. - View cart will be displayed as popup in a lightbox so the user does not need to leave the page to view the content of the cart. - Easily add other payment processors or use the built-in order processing script.